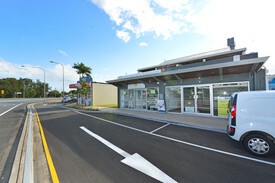 7 Commercial Real Estate & Properties in Mudjimba are listed in 2 categories. We have 5 OfficesSale & Lease and 2 Retail ShopsSale & Lease . Located on David Low Way in the heart of Mudjimba adjacent to Coles Supermarket and a plethora of shops, cafes, restaurants and service businesses. + 65sq m (approx) + On site parking + Flexible leasing options + Available now Call or email Matt Marenko or Louisa Blennerhassett to inspect the property or find out about other suitable options. Our team is strategically located in two offices across the Sunshine Coast region and is ready to handle your commercial, industrial and retail property needs today so call or email now. Stand Alone With Return $1,250,000 + GST (if appl..
Light filled fitted office of 125sq m (approx) located on David Low Way in the heart of Mudjimba adjacent to Coles Supermarket and a plethora of shops, cafes, restaurants and service businesses. + 125sq m (approx) Fitted with four offices, kitchen and an open plan area including reception + Private balcony + On site parking + Flexible leasing options + Available now Call or email Matthew Marenko or Louisa Blennerhassett to inspect the property or find out about other suitable options. Our team is strategically located in two offices across the Sunshine Coast region and is ready to handle your commercial, industrial and retail property needs today so call or email now. Ray White Commercial Northern Corridor Group are pleased to present 125m2 Area Currently has a great fit out Signage available Ample car parking Please contact our leasing team to arrange your inspection. Affordable Office Space In Mudjimba $23,946 p.a. + Outgoings ..